When we were first invited to see this new LED technology in prototype, we were extremely interested in its possibilities... Then, after 10 months of clinical trials, we were convinced that it would become our new 'standard' in a photo rejuvenation head. Simply put, it marries the best in an amber output - prompting a better lymphatic push - with the advantages of red, better serving Rosacea and other red-based, ruddy anomalies. And it would do so without any 'destructive interference' between wavelengths, from a single LED substrate - unlike placing one wavelength next to another. While appearing basically 'red' to the human eye (unless placed next to an actual red LED, where it then appears to have a tinge of 'orange'), a central 605nm peak wavelength sweeps down to 585nm ... and up to 635nm. It is a broader 'bell curve' in this new LED technology that makes it possible - without a single drawback in photo rejuvenation applications ... only benefit. And what is Spectral Bandpass Technology ? It would be originally used on our large Planar Panel Head to reduce the perceived optical glare to the eye where there were fistfuls of LEDs - while allowing the desired wavelengths to pass without restriction. It essentially involves a wavelength-specific filter that's placed in front of the LEDs. Now, with the large wand-based Cello heads, we've brought the addition to these heads as well. Our AmRed filter needed to be 'broader' in the light it would pass because the AmRed LEDs have a broader spectral output curve that sweeps into the amber range and to 'narrow-filter' it too much would impede the innate benefits of the AmRed technology. With that, it's still a 'Bright Head', but offers less eye-wincing glare than without the bandpass filtering. With the Blues and Greens, we could use more 'narrow-band' filtration and, with entirely different optical designs, we could reduce the apparent brightness more significantly - as well as 'soften' the LEDs through two-stage diffusion. It might be noted here that the human eye has non-linear sensitivity to color and that's why all of our heads through the years would appear to have different 'brightness levels' - even as they'd measure the same on the lab bench, relative to the desired wavelength. Spectral Bandpass Filtering takes this phenomenon a step further. But do know that, unlike lasers, our LEDs will do no harm to the eyes. In fact, with the eyelids closed - as would be typical - more light streams through the lids as you lay around the pool without sunglasses. Excellent replacment for the smaller wand heads of years gone by. This one has a four inch (100mm) diameter. Be done in half the time (15 minutes or so). The 'Soft Blues' & 'Soft 'Greens'. They're Different. A different optical design than the AmReds, optimized for surface and near-surface conditions. 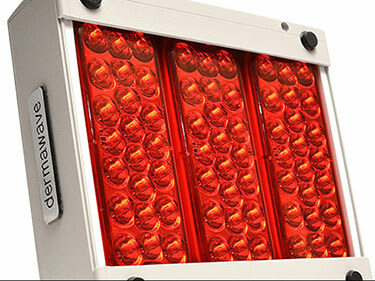 In testing a variety of LED 'Blues', we applied a single LED to single acne blemishes. And what did we come to discover? That other blemish outbreaks as far as 10~15 millimeters away were also treated! We learned that providing the appropriate wavelength to an area pulled the oxygen-carrying endogenic porphyrins in the body to to a broader swatch outside of the LED beam! This, combined with larger LEDs - relative to our previous Blue wand heads - allowed us to produce the large Cello version more efficiently that should, otherwise, cost more. As it turns out, as another 'near-surface' consideration, we were able to take a similar approach to our 'Green Beam' melanocyte regulation head. Both use narrow-band filtering that also feature moderate diffusion in the multi-stage filters. And beyond the filters - in front of each LED - are concentric diffusion discs that further disperse the beam in the way we wanted. In all, relatively low impact on the eyes while producing the selective wavelengths we desired. This 4-inch DermaWave head emits a true 420 nanometer wavelength cluster of light, penetrating the skin tissue to target mild to moderate P. acne, specifically (the 'P' stands for Propionibacterium) . Unlike the more common 460 - 470 nanometer "Blue Heads" offered by others (often inaccurately labeling them as 420nm, when actually measured at 470nm), the DermaWave Blue Beam, operating at a higher frequency (shorter wavelength), results in a true counter-bacterial response by way of photo destruction of common acne bacteria. This particular spectrum increases the release of oxygen-carrying, endogenic porphyrins -- that attacks the P. acne bacteria below the skin surface at a faster rate than the problematic Propionibacterium, itself, can reproduce. This head is not appropriate for cystic acne (uncommon), however, but rather the more common inflammatory acne. It is better suited for mild to moderate acne. The highly unique DermaWave 'Blue Beam Head' may be used alone for acne-specific treatments or be incorporated within other skin care sessions. It may be used in conjunction with your favorite acne-related products, if you prefer, without harm. The 420 nanometer Blue Beam Head is also used in combination with the standard Photo Rejuvenation head that is normally equipped with the DermaWave console to help reduce acne-related inflammation. Need only be used on acne affected areas, so it doesn't take too long per session. It's now been demonstrated that the application of this wavelength helps regulate the skin's melanocytes, further improving the flesh tone when it follows an application of the standard photo rejuvenation head. It's what to use when a more even and improved skin tone is your specific Photo Rejuvenation target. An allied benefit is that it can also increase the longevity of the flesh tone achieved with the standard head through melanocyte regulation. Each contains a three-bank, sub-panel system that's aligned for 'cross-firing' across the LED arrays. And beyond this, each and every LED also cross-fires on itself via parabolic optical amplification. In fact, each 10mm parabolic unit has an output that's nominally equivalent to 24 conventional LEDs operating at once! That would be the total aggregate output of hundreds of LEDs that we couldn't otherwise fit in the same space! And, uniquely, each panel employs Spectral Bandpass filtering that only allows the desired wavelength spectrum to precisely pass unimpeded while increasing optical safety. In fact, no eye protection is required. The client need only ... close their eyes. The standard head that comes with the DermaWave Cubic 7 Planar System is available as a separate unit for previous DermaWave owners, as well as for those who wish to run two heads at once on the Cubic 7 for the speediest and most efficient of systems. Just plug it into any Smart Port ... And yes, as promised, it also makes an excellent Body Treatment Head, additionally helping to reduce the appearance of cellulite. Amazingly versatile.